N’Golo Kanté joined Leicester City on August 3rd, 2015 for a measly £7.65m. Almost two years later, he stands as one of only two players to have won back-to-back Premier League titles with two different teams. The other being Eric Cantona. Since his arrival in England, the PFA Player of the Year has captured the hearts of fans across the country with his selfless personality and true passion for the beautiful game. With his enthusiasm and tenacity on the pitch, Kanté has rightfully etched his name into Premier League history books. In turn, he has become an integral part of his new boss, Antonio Conte’s plans. Having elevated Leicester City to their first ever Premier League title, Kanté caught the eye of new Chelsea manager Antonio Conte who saw much of himself in the young Parisian. His selflessness and tenacity proved to be irresistible to the Italian and so Kanté joined the west London club for £30.43m on July 16, 2016. During his teenage years, it was that very selflessness which caused scouts and coaches alike to ignore Kanté. At only 5’5 and 150lbs at the age of 26, he lacked the physical prowess as a youngster to be deemed to have any potential in France, who at the time had the likes of Patrick Viera in the centre of midfield. It was only through association that Kanté was given a chance at a professional club, where he joined then Ligue 2 outfit Boulogne. For three years, he fought his way up the ranks, before a move to Caen gave him the breakthrough he needed. After helping his team win promotion to Ligue 1, Kanté shone in his second season, where he was scouted by Steve Walsh, who had famously facilitated the transfers of both Jamie Vardy and Riyad Mahrez to Leicester City. A strong campaign in Ligue 1 persuaded Leicester to take a chance, and so the young Frenchman made his way over to the Premier League. While exceptionally gifted, Kanté remains humble. He brings nothing onto the pitch but his enthusiasm and sheer desire to win. He understands what is expected of him, and he executes his task to perfection. He’s simply a no-nonsense midfielder; he doesn’t score thirty-yard screamers, he doesn’t beat three men with elusive trickery and he shows little emotion on the field. He simplifies the central midfield role in such a way that it looks easy, almost like second nature to him; those qualities cannot be taught, they’re simply a reflection of who he is as a person. N’golo Kanté loves football, and football loves him. Yet, for those of us who wish to understand what makes him so different, that’s simply not enough. So, I put pen to paper, loaded up some recent games and spent a quiet Monday afternoon trying to figure out how and why. First of all, Kanté is a perfect fit for Conte’s system. His versatility allows him to launch an attacking move from the centre, or cover teammates who have pushed into the opponents’ half. With two wide centre backs and two attacking inside forwards, Conte prefers his team to build up via the wings with combination moves. For example, RCB passes to RWB, who then feeds the ball into the RIF, ST or RCM. 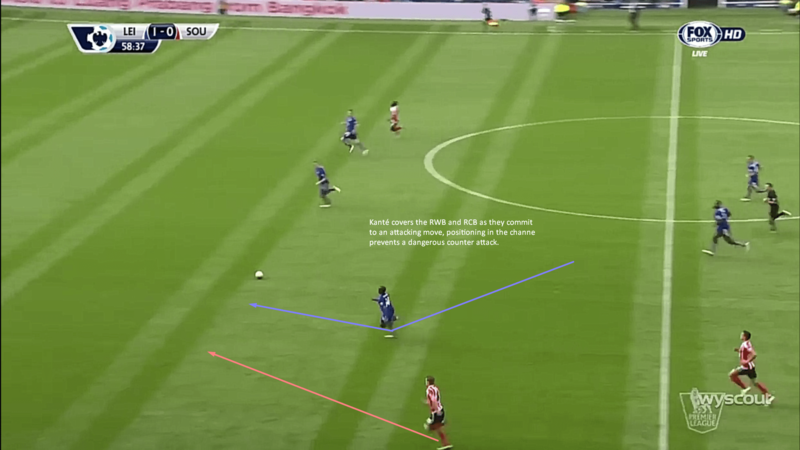 These combinations allow Chelsea to break through any lines of pressure and keep their attack moving swiftly. With Kanté’s proficiency on the ball in the centre, Chelsea are able to link their attack to other zones across the field, should their opponents press intensely or if the zone simply gets crowded. Kanté is not only an outlet but an integral part of Chelsea’s attacking build up. If their opponents do press the ball, Kanté is in a central position ready to receive, from which he has a full 360-degree spectrum of movement ahead of him, as opposed to the 180-degree view on the wing. Therefore, he is able to keep the attack flowing with a forward ball into the IF or ST, or he can turn and play the ball across to the opposite wing via a short pass to the opposite CM, CB or WB with a long diagonal ball, which he often prefers. Kanté’s positioning during such play is also key to Chelsea’s success. As he drifts over into the ball near half-space to keep the combination passes short and sharp, he opens up a passing lane to the more attacking players ahead of him, either for himself or for his teammate. This system works particularly well against man-oriented defensive schemes, which often cause players to follow a single player in the hope that their teammate can cover anything behind them. This is entirely different to the role which Kanté was given at Leicester, which was primarily to win the ball and quickly offload it to Drinkwater who would then orchestrate a counter-attack. While his build-up play at the Foxes was good, it’s been at a whole other level since he joined Chelsea. One part of his play that I feel is often overlooked is his ability to beat his man with a quick change of direction. He uses this technique both in attack and defence to create the space necessary to progress the attacking move or to free himself from the opposition press. At just 5’5, his centre of gravity is low which makes it easier for him to change direction when compared to someone who is, say, 6’0 or even 5’9. Coupled with his explosiveness on the turn, Kanté is able to change direction in the blink of an eye and catch opponents on the back foot. He carries the ball well through open space, often taking softer touches which keep the ball closer to his body, which increases the opportunity for him to make a cut to either side. Subtle changes in his speed when approaching his opponent forces them to commit, opening up a lane which to dribble through. Communication in any team sport, not just football, is everything. The good players are the ones who communicate effectively, verbal or non-verbal. The great players are the ones who are able to process that information efficiently and then act upon it accordingly. N’Golo Kanté’s ability to process information and then act upon it correctly is second to none; it’s why he always seems to be in the right place at the right time. He understands exactly what he has to do, how to do it, and how not to. Due to his innate ability to process the information around him, Kanté rarely finds himself out of position. He understands which situations favour him, and prioritises defending the centre of the field over anything else, which can sometimes be a risky move. His insurance is his acceleration; within seconds he is able to close down his opponent and force them to play the ball backwards or horizontally – he very rarely allows a forward pass. That acceleration permits Kanté to follow his man loosely in the knowledge he can make up the ground. Thus, he can focus on cutting off passing lanes into the final third, where his defenders run the risk of being overloaded in wide areas. By delaying an opponents’ attack, he affords time for his defensive partners to regain their structure and for his attacking teammates to press the ball carrier. On the offensive side of the ball, should the combination play in the wide areas prove successful, Kanté often drops into the space behind the Wing Back, ceasing any attempt by his opponents to exploit the now-imbalanced defensive structure. With the other Central Midfielder covering him, Kanté can now be used as an outlet to recycle possession, where he may look to switch the ball or link up with any one of four possible short passing options (three Centre Backs, Central Midfielder and the advanced Wing Back). Kanté’s energetic play style means he is an ideal candidate to press when caught in a more advanced position. Again, his acceleration causes problems for defenders and midfielders alike who are looking to launch an attack without having any real chance to survey the field ahead of them. This aggressiveness forces his opponents’ hand, who then quickly has to choose to beat Kanté in a one-on-one situation or look to offload the ball to a nearby teammate who can look to beat the press with quick forward passes. When forced into a one-on-one, N’Golo utilises his small frame and attempts to make himself look “big” going into the tackle; similar to how a goalkeeper would to cut potential shooting angles. He spreads his legs wide and lowers his body, which heightens his ability to change direction, therefore allowing him to defend reactively against the dribble. The lower centre of gravity negates any attempt to run through him, and so players are forced around him; again, where his speed of mind and explosiveness make it an almost impossible feat. After watching hours of game footage, one attribute which stood out was Kanté’s patience, particularly when defending. It’s easy to applaud his tireless movements with and without the ball, his endless running and willing to press, but it’s his patience which gives him the edge over his opponents. With an opponent carrying the ball through the centre, he waits for his teammates to regain their structure before committing to the press, as not to leave any open space behind. Once engaged in his press, he forces the attacker to commit to an action but waits until they have completed it before making a tackle. The likelihood of a forward pass is low, due to his teammates now being in position, and so the opponent is forced into a one-on-one. Again, Kanté waits for his moment and takes the ball while his opponent is off balance and unable to protect it. This also gives him little competition upon completing the challenge, as the attacker is likely regaining their balance, by which time Kanté has offloaded the ball to a teammate. This patience was key to Leicester’s success last season, and it has become so too for Chelsea this year. Another technique which Kanté is able to utilise effectively is tackling from the blindside; most importantly, without giving away a foul. Chelsea’s back three rarely dive in, instead they opt to slow their opponents down while a more advanced teammate looks to come back and press from the blindside. 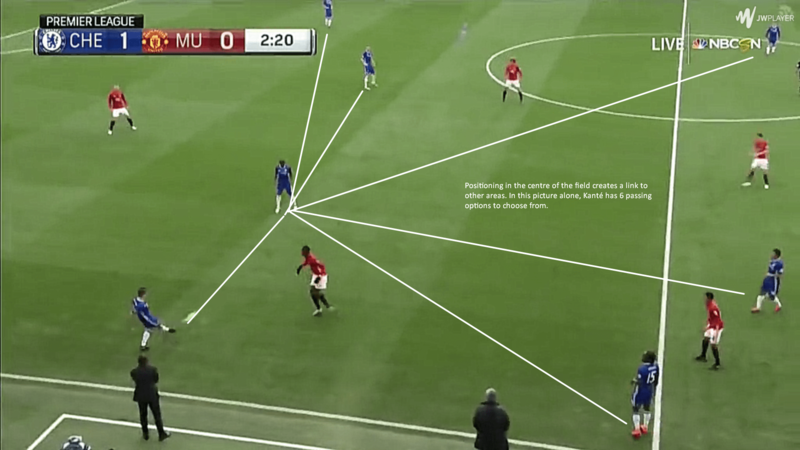 By cutting off any retreat with the ball, pressing from a player’s blindside forces them to commit to a forward action – with Chelsea’s defensive setup, that means trying to beat at least two Centre Backs. Once engaged in the press, a defender steps up and Kanté uses his speed and small frame to work his way in between his opponent and the ball, which is where his impeccable timing in the tackle comes to fruition. Above all, however, it’s Kanté’s selflessness which has seen his meteoric rise to the top of football’s elite. Rarely do we see a player so committed to the cause and so conscious of “the bigger picture”. His generous personality is clear in all aspects of his game, be it creating space with third-man runs or looking to recycle possession into wide areas in order to maintain pressure. N’Golo Kanté’s football intelligence is on a level with world football’s finest, as is his tremendous consistency. His play style is so unremarkable yet he deserves all the credit he receives because of it. He’s one of the few players who make football look easy; he understands exactly what he needs to do, and how to do it.